It's infuriating when agents outside of Israel act against Israel. But there is something uniquely distressing about damage we do to ourselves. This is what I'm seeing now -- and feel compelled to write about. The current situation is not only unacceptable, it's intolerable. First, there is the prisoner release that took place this week. Ostensibly, because we "promised" at the beginning of the negotiations. It was the lure to bring the PA to the table. 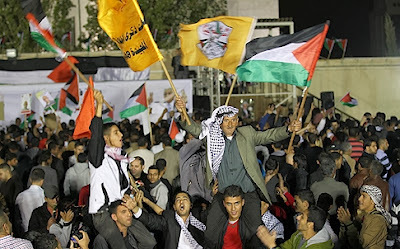 No one in Israeli officialdom, it seems, ever confronts the question of why the PA would need an enticement to come negotiate in order to secure the state they keep claiming they want. They should be running to talk. When the time for releasing the prisoners approached, and there was much protest on the right, the left -- and most specifically Tzipi Livni -- made an accusation: Well, you could have agreed to freeze settlements instead (about which more following). But since you refused to stop building, we had to promise the prisoner release. Excuse me? We had to? It was incumbent upon us to make some sort of commitment that is not in Israel's best interests? "This is a lie and a total fabrication. [That he agreed to a release of prisoners to protect construction.] I was never presented with those two possibilities. Netanyahu told me [about the prisoner release] after it was a fait accompli." There is no question but that the PA has been pumping for release of prisoners and referring to it as a key priority. This said, however, the promise -- the commitment to release prisoners -- is not really to the PA but to Obama. That there was great pressure from the White House is certainly the case. In his eagerness to be able to boast a diplomatic achievement in this part of the world, Obama bent over backwards to find ways in which Israel might entice Abbas. But there is a time to say NO. A demonstration at Ofer Prison, where the terrorists about to be released were held; protests registered by members of the coalition; the emotional pleas of families of the victims of these terrorists -- none of it made a difference to Netanyahu, who insisted that a promise had been made and it was necessary to follow through. "The decision to free prisoners is one of the difficult I have made as prime minister," he declared. "This decision was necessary in our current reality. We have to navigate through a complex international area full of challenges." I believe that Netanyahu is severely deluded -- that within his distorted view of matters he continues to believe, in the face of much evidence to the contrary, that there are rewards from the international community for Israeli sacrifices. Yesterday, Defense Minister Moshe Ya'alon echoed his boss, saying that the prisoner release was necessary because of "long-term security considerations." Time was, when this refrain was fed to the Israeli public, I would wonder if maybe, just maybe, there was a quid pro quo coming down the road for what was being done -- something we were not aware of. I stopped wondering about that a long time ago. It's nonsense. Twenty-six prisoners were released. Five to Gaza, and 21 to Palestinian Arab areas of Judea and Samaria. Those 21 were let go in the small hours of the morning on Wednesday -- the intent being to damp down media attention and celebration by the PA. It didn't work. The PA celebration was larger than it had been with the first release this summer (104 are slated for release in four intervals). Murderers, welcomed home like victors. Every single one has Jewish blood on his hands. "Terrorists who kidnapped, lynched and murdered IDF soldiers and reservists; ambushed and slaughtered unarmed hikers; killed a defenseless couple sitting in their care in a secluded forest at night..."
What sort of nation releases such terrorists from its prisons? And what sort of people celebrate and adulate their terrorists? Abbas hugged and kissed them all, calling them "heroes." Yesterday he declared that there would be no agreement with Israel as long as even one Palestinian Arab remained in Israeli prisons. Also yesterday, the Israeli government announced plans for additional building over the pre-1967 line -- with final permits having been given for 1,500 apartments in Jerusalem (Ramat Shlomo, pictured) and hundreds more in communities in the large blocs in Judea and Samaria, such as Ma'aleh Adumim, Betar Illit, and Ariel. Additionally, preliminary plans were announced for another 2,000 units beyond the security barrier and outside the large blocs, in communities such as Ofra, Beit El and Shilo. 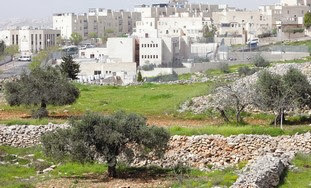 The prime minister also gave the final go-ahead to a national park east of Hebrew University's Mount Scopus Campus and for a tourism and archeological center opposite the entrance to the City of David. All this building is great. But the timing of this announcement is hardly a coincidence, and the intent here on Netanyahu's part to mollify the right wing of his coalition after the prisoner release is obvious and publicly acknowledged. As could have been predicted, there was a furor over this, with Palestinian officials saying that this was "destroying the peace process." My favorite headline on this issue came from Israel National News yesterday: "Ban: Releasing Murderers is Good, Building is Bad." That about sums up the international attitude in many quarters. No criticism that Abbas kisses terrorists. That's not counterproductive to "peace." Hey, so what if it incites Palestinian Arabs to be like those celebrated terrorists? But building past the pre-1967 line, that's a whole other story. The UN Secretary-General says it's "contrary to international law." He's walking proof of our need to solidly promote the Levy Report. Interestingly, the JPost today cites an Israeli official who said that the US and the PA both knew that our release of prisoners would be accompanied by an announcement of construction plans. Now, having mentioned Ban, let me segue into a related issue at the UN -- this regarding the UN Human Rights Council. About 18 months ago, Israel walked away from participation in the Council because of a continued and egregious bias against the Jewish state. "The Council...adopted a short permanent agenda that governs every regular session. It contains one item for censuring Israel alone [Agenda Item 7], and one general item for all other 192 UN countries combined. Thirty-five per cent of all the resolutions the Council has passed that are critical of specific states have been directed at Israel – compared to nothing on states like Russia, China, or Saudi Arabia." The Europeans and the US, warned Bayefsky, were "strong-arming" Israel into rejoining the Council. She provided a painful picture of the way in which the Council operates. Unfortunately, on Tuesday, Israel caved to that massive pressure and came forward for additional biased treatment, assurances to the contrary not withstanding. "Admitting that the council has a 'strong bias against Israel,' the US delegation to the UNHRC nevertheless argued that by staying away, Israel was forgoing the opportunity to 'present its own narrative.' The trouble, though, is that nobody at the council is listening. "...Now Israel has switched tack and two days ago defended its record in a hearing that descended into a kangaroo court, where some of the most repressive regimes pass judgment on a sterling democracy and where the damning verdict [in a "Periodic Review"] had been composed long before the proceedings began." "All of them [the released prisoners] have blood on their hands; all of them have murdered Israelis. Their release, I believe, illustrates Israel's determination to reach an agreement with our Palestinian neighbors..."
How pathetic can it get? We need a huge dose of national pride. Let me note here that, while Washington thinks nothing of strong-arming Israel, yesterday, Kerry observed that the US would "not succumb" to fear tactics by those opposing the diplomatic engagement with Iran. But let me end on an upbeat note. For a very brief interval of time recently, Abbas, speaking for the PA, reportedly said that he would consider an interim agreement with Israel -- something that, according to rumors, Netanyahu is seeking, since he knows that a final agreement will not happen. But very quickly thereafter, Abbas claimed he never said anything of the sort. Either he was misquoted in the first place, or he backtracked in the face of enormous anger from his own people. Now Abbas has returned to demanding everything: Israel's return behind the pre-1967 line, half of Jerusalem as a Palestinian Arab capital, etc. etc. In any event, the assessing is that whether Netanyahu may have been shooting for this -- as Deputy Minister of Defense Danny Danon has charged -- or not, the current composition of the government would make such a deal impossible. From an impeccable source, I have it that Saudi Arabia is so furious at the US for Obama's stand on Iran and on Syria, that Saudi officials are advising the PA not to cooperate with Obama. What is more, some Fatah officials are saying that they won't consider any compromise in negotiations because they don't trust Obama. Technorati Tag: Israel and Palestinians and Abbas and UN.